Saturday, April 27th from 10 a.m. - 4 p.m. This sale includes our usual large selection of fiction and mystery books, and many categories of nonfiction, antiquarian, and special price books. At least 300 cartons of books will be available. You will be glad you came! Plan to attend? Please remember to bring your current (2019) Friends of the Castro Valley Library membership card in order to take advantage of your $2.00 discount. You can join or renew at the door, or purchase a membership ahead of time from the Friends Bookstore. Friends of the Castro Valley Library is a non-profit 501(c)(3) organization serving our community and supporting the Castro Valley Library by providing funds for library services, organizing fund raising and community activities, advocating at the local, state and national level for public support of libraries and developing an active and well-informed membership. Our BookStore contains over 2500 almost new and used books, audiotapes, CDs and DVDs with a constant turnover of the inventory. Only the best quality of all the donated books are sold in the store. Special books may be sold online through Amazon.com. In addition, each year over 1200 boxes of good quality books and audio-visual materials are put in temporary storage for our three annual weekend Book Sales. We also have off-site sales at Zocalo Café in San Leandro. 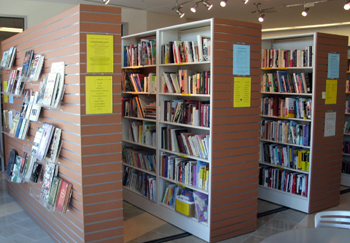 Remaining books are donated to deserving organizations and programs throughout Alameda County. The Friends currently have over 100 books and other media listed on Amazon.com. Our name on Amazon is FriendsofBooks, and our entire on-line store can be viewed at http://www.amazon.com/shops/A1AE92DUB78GQ4. You can access the store by typing the above string in your browser, by clicking on our name when viewing one of our listings or by clicking on the link above. Don’t forget to mention us when purchasing through Amazon Smile. When you select Friends of the Castro Valley Library as your charity of choice, we will receive a 0.5% donation every time you make a purchase. Many great items “from soup to nuts” are designated as Smile products, so please check it out. Visit our on-line store to see what we're offering today! Support Friends of the Castro Valley Library with your donation. Buy books and other media from the Friends at FriendsofBooks on Amazon. 12 noon to 5:30 pm.